We are delighted you are considering the Scarborough Fair Collection & Vintage Transport Museum for your forthcoming function/event and we will endeavour to fulfill all your requirements on the day. Graham Atkinson has built up one of the largest and finest collections of working steam Showman’s Engines, Vintage Cars, Miniature Vehicles, Fairground rides and Mechanical Organ’s in the UK and we believe the Scarborough Fair Collection & Vintage Transport Museum will provide a unique setting for your, birthday, anniversary, concert or corporate event. 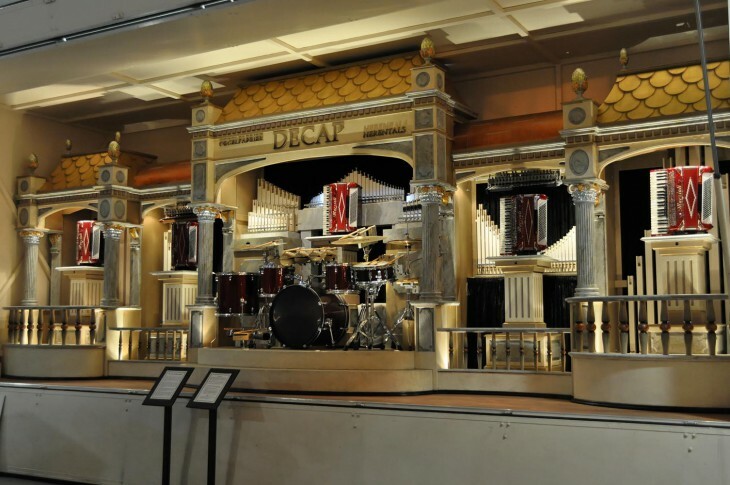 A large dance floor with vintage dance organs flanking the walls and the ‘Mighty’ Wurlitzer taking centre stage. When arranged as a theatre, the ballroom seats up to 430. The large stage has changing room facilities, lighting and sound. We have a fully stocked bar and can help arrange catering from afternoon tea to a banquet. Hire the rides for the first hour of your event. Take a ride on the Golden Galloping Horses, the Caterpillar, Austin Cars, Dodgems, the Ark Speedway, the Cake Walk, the Ghost Train, Junior Gallopers and the Halstead hand turned roundabout. Fairground Rides – They are all heritage rides and there is no guarantee that they will all be up and running, however we will endeavour to fulfil your requirements on the day. SAFETY NOTICE – USE OF FAIRGROUND RIDES IS ONLY PERMITTED DURING THE FIRST HOUR OF THE MUSEUM HIRE. We are happy to help you plan your event – get in touch to discuss your requirements or to book your event at the Scarborough Fair Collection.